Hazardous Level: Cockroaches are second to houseflies for spreading diseases. Recognize a cockroach. The most common cockroach in Canada is the German Cockroach. It has a flattened oval body with long spiny legs and measures 15mm when fully grown. Male and females have wings. Colour is light brown with two dark brown stripes running down the back. Cockroaches are dirty insects that will crawl all over your food and dishes Typically they are most seen in the night and run and hide when the lights are turned on. 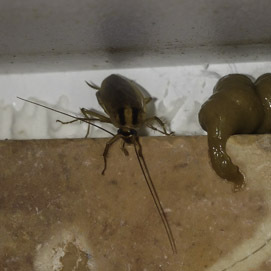 [caption id="attachment_491" align="alignright" width="271"] Cockroach baited[/caption] Cockroaches can spread disease by contaminating human food & pet foods alike with germs they pick up in latrines, garbage and dumps. 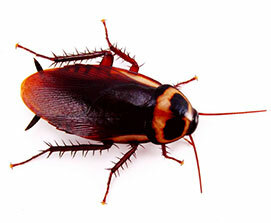 Cockroaches can carry a variety of diseases that include cholera and pathogens such as salmonella. The Anypest team can get rid of these pest in as little as one treatment! We use a insecticide dust in cracks and voids under fridges stoves and behind cupboards The next step is baiting the roaches with highly effective gel bait. In most cases the roaches are out of your home in as little as a few days. Yes. Cockroaches are second only to houseflies for spreading diseases. They are capable of transmitting diseases such as salmonella bacteria (food poisoning), polio, etc. Where am I most likely to see Cockroaches? Cockroaches are nocturnal and are most active at night. Cockroaches are attracted to food, water, warmth and shelter. Their habitat is around sinks, behind appliances, in drains and cracks. The female cockroach caries an egg capsule containing approx. 40 eggs. Development from eggs to adults takes three to four months. Cockroaches live up to a year. An infestation of cockroaches can number in the thousands. If I have an infestation of cockroaches what can be done to eliminate them? Eliminating cockroaches is not an easy task, and it's a difficult undertaking. Due to the nature of cockroaches, control is a process requiring intensive knowledge. It is recommended that you seek the services of a qualified Pest Control professional to eliminate pests for thorough results. These tend to be found in Northern areas of Hamilton. They are slow moving insects that can't climb very well, which makes them seem like they'd be easy to eliminate, but they are nearly indestructible. Also called a waterbug, you'll see these critters skitter out of your drain pipes on a regular basis, bringing filth up with them. These cockroaches are less frequent, but you'll spot them in Hamilton, Oakville and Burlington on occasion. They prefer warm and dry spots, like inside your computer, around drapes or behind picture frames. They paste their eggs to furniture, which makes them easy to differentiate from the German Cockroach who drop their egg sacks. This entry was posted in Pests on 2014/07/07 by Any Pest.